For other places with the same name, see Kresy (disambiguation). Kresy Wschodnie or Kresy (Polish pronunciation: [ˈkrɛsɨ], Eastern Borderlands, or Borderlands) was a historical region of the Second Polish Republic during the interwar period constituting nearly half of the territory of the state; where the ethnic Poles, being the largest group, were roughly equal in their number to the size of the national minorities (with notable exceptions). Administratively, the territory of Kresy was composed of voivodeships of Lwów, Nowogródek, Polesie, Stanisławów, Tarnopol, Wilno, Wołyń, and the Białystok. Today, these territories are divided between Western Ukraine, Western Belarus, and south-eastern Lithuania, with such major cities as Lviv, Vilnius, and Hrodna no longer in Poland. In the Second Polish Republic the term Kresy roughly equated with the lands beyond the so-called Curzon Line, which was suggested after World War I in December 1919 by the British Foreign Office as the eastern border of the re-emerging sovereign Republic following the century of partitions. In September 1939, after the Soviet Union joined Nazi Germany in their attack on Poland in accordance with the Molotov–Ribbentrop Pact, the territories were incorporated into Soviet Ukraine, Belarus and Lithuania in the atmosphere of terror. Following the failure of German Operation Barbarossa, the Soviet gains were ratified by the Western Allies at the Tehran conference, the Yalta conference and the Potsdam conference. When the Soviet Union broke up, the former Kresy remained a significant part of the former Soviet republics as they gained independence. Even though the Eastern Borderlands are no longer in Poland, the area is still inhabited by Polish minorities, and the memory of Kresy is still cultivated among them, though the attachment to the "myth of Kresy", including the prewar vision of the region as a peaceful, idyllic, rural land, has been criticized in the Polish political discourse after the collapse of the Soviet Union. Economically the region was less developed than the western part of interwar Poland, and had the lowest literacy level of the nation, which was the result of more than one hundred years of Austro-Hungarian and Russian imperial rule. Education was not compulsory in the Russian Empire. Polish voivodeships 1922–1939. One can consider the eastern voivodships as roughly equivalent with 'Kresy'. The Polish word kresy ("borderlands") is the plural form of the word kres (the farthest reach). According to Zbigniew Gołąb, it is "a medieval borrowing from German word Kreis", which in the Middle Ages meant Kreislinie, Umkreis, Landeskreis ("borderline, circuit, or district"). Samuel Linde in his Dictionary of the Polish Language gives a different etymology of the term. According to him, kresy meant the borderline between Poland and the Crimean Khanate, in the area of the lower Dnieper. The word kresy was probably used for the first time in literature by Wincenty Pol in his poems "Mohort" (1854) and "Pieśń o ziemi naszej". Pol claimed that it was the line from the Dniester to the Dnieper River, the Tatar borderland. At the beginning of the 20th century, the meaning of the term expanded to include the lands of the former eastern provinces of the Polish-Lithuanian Commonwealth, to the east of the Lwów–Wilno line. In the Second Polish Republic, the borderlands were equated with the land to the east of Curzon line. Currently, the term describes all eastern lands of the Second Polish Republic that no longer belong to modern Poland, plus lands further east, which had belonged to the Commonwealth before 1772, and in which existed Polish communities. Polish expansion eastwards dates back to the earliest days of Poland. In 1018, King Bolesław I Chrobry invaded Kievan Rus (see Boleslaw I's intervention in the Kievan succession crisis, 1018), capturing Kiev, and re-annexing Red Strongholds. In 1340, Red Ruthenia came under Polish control, which opened these lands for Polish colonization and polonization. After the Union of Lublin of 1569, more Polish settlers moved to the eastern borderlands of the vast Polish-Lithuanian Commonwealth. Most of them came from the Polish provinces of Mazovia and Lesser Poland. They gradually moved eastwards, inhabiting sparsely populated areas, dominated by local peoples (Lithuanians and Ruthenians). Furthermore, the upper classes of the Kresy accepted Polish culture and language, which resulted in their polonization. The year 1772 marked the first partition of the Commonwealth (see Partitions of Poland). By 1795, the whole eastern half of the country was annexed by the Russian Empire, and these lands came to be called the Stolen Lands. Even though Poles were in the minority in those areas, the "Stolen Lands" were important part of Polish culture, with such colleges as Wilno University and Liceum Krzemienieckie. Since a number of inhabitants actively participated in national rebellions (November Uprising, January Uprising), Russian authorities exercised persecutions, forced resettlement, penal deportations to Siberia, and denationalization of Poles. The years 1918–1921 were especially turbulent for the Kresy, as it was the time of the rebirth of the Polish state and the formation of new borders. At that time, Poland was fighting three wars to establish its eastern borders: with Ukraine (see Polish–Ukrainian War), the Soviet Union (see Polish–Soviet War), and Lithuania (see Polish–Lithuanian War). All these conflicts were won by Poland, and as a result, it annexed territories that had previously been under Russian administration situated to the east of the Curzon line, plus formerly Austrian Eastern Galicia. This area later formed the eastern provinces of the Second Polish Republic. Territories that were included in the Kresy in the interbellum period comprised the eastern part of Lwów Voivodeship, Nowogródek Voivodeship, Polesie Voivodeship, Stanisławów Voivodeship, Tarnopol Voivodeship, Wilno Voivodeship, Wołyń Voivodeship, and the eastern part of Białystok Voivideship. 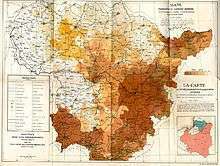 The Polish government carried out an active policy of Polonization in these territories (see Osadnik), and as a result, in the southeastern part of the Kresy, conflicts with Ukrainians were frequent (see Pacification of Ukrainians in Eastern Galicia (1930)). Beyond the eastern border of the Second Polish Republic numerous Polish settlements continued to exist, especially around Minsk, Zhytomir and Berdychev. In the late 1920s and early 1930s, Soviet authorities created two Polish Autonomous Districts in Belarus and Ukraine, but during Polish operation of the NKVD, most of the Poles in those areas were murdered, and the remaining ones were resettled to Kazakhstan (see also Poles in the former Soviet Union). As a consequence of the Molotov–Ribbentrop Pact, on September 17, 1939, the Kresy territories were annexed by the Soviet Union (see Soviet invasion of Poland), and a significant part of the ethnic Polish population of the Kresy was deported to other areas of the Soviet Union including Siberia and Kazakhstan. The new border between Nazi Germany and the Soviet Union was designated by a formal Agreement on Borders and Friendship, signed on September 29, 1939. After rigged elections, communist governments for Western Ukraine and Western Belarus were formed and immediately announced their intention of joining their respective republics to the Soviet Union (see also Territories of Poland annexed by the Soviet Union). After the German invasion of the USSR, the southeastern part of the Kresy were included into Greater Germany's General Government, whilst the rest was passed to the Reichskommissariats Ostland and Ukraine. In 1943–1944, units of the Ukrainian Insurgent Army, with help of local Ukrainian peasants, carried out mass murder of Poles living in the southeastern Kresy (see Massacres of Poles in Wołyń). In January 1944, Soviet troops reached the former Polish–Soviet border, and by the end of July 1944 they again brought the whole territory that had been annexed by the USSR in September 1939 under their control. During the Tehran Conference in 1943, a new Soviet-Polish border was established, in effect sanctioning most of the Soviet territorial acquisitions from September 1939 (except for some areas around Białystok and Przemyśl), and ignoring protests from the Polish government-in-exile in London. The Potsdam Conference, via substantive recognition of the pro-Soviet Polish Committee of National Liberation, implicitly consented to the deportation of the Polish people from the Kresy (see Polish population transfers (1944–1946)). Most of the Polish inhabitants of the Kresy were ordered by the Soviets to move to the former German eastern provinces, the so-called Recovered Territories of the People's Republic of Poland. Poles from the southern Kresy (now Ukraine) settled mainly in Silesia, while those from the north (Belarus and Lithuania) moved to Pomerania and Masuria. Polish residents of Lwów settled not only in Wrocław, but also Gliwice and Bytom. These cities were not destroyed during the war; also they are located relatively close to Lwów, which was important in case of an expected sudden return to the East. Frequently, whole Kresy villages and towns moved in one rail transport to new locations. The village of Biała, near Chojnów, is still divided into two parts: Lower Biała and Upper Biała. Lower Biała was settled by people who used to live in a Bieszczady village of Polana near Ustrzyki Dolne (this area belonged to the Soviet Union until 1951: see 1951 Polish–Soviet territorial exchange), while inhabitants of the village Pyszkowce near Buchach moved to Upper Biała. Every year in September, Biała is home to an annual festival called Kresowiana. In Szczecin and Polish West Pomerania, in the immediate postwar period, one-third of Polish settlers were either people from Kresy or Sybiraks. In 1948, people born in the Eastern Borderlands made up 47.5% of the population of Opole, 44.7% of Baborów, 47.5% of Wołczyn, 42.1% of Głubczyce, 40.1% of Lewin Brzeski, and 32.6% of Brzeg. In 2011, people with Kresy background made up 25% of the population of the Opole Voivodeship. The town of Jasień was settled by people from the area of Ternopil in late 1945 and early 1946, while Poles from Borschiv moved to Trzcińsko-Zdrój and Chojna. The situation was completely different in Wschowa and its county. In 1945–1948, more than 8,000 people moved there. They came from different areas of the Kresy — Ashmyany, Stanislawow, Równe, Lwów, Brody, Dziatłava district, and Tarnopol. Altogether, between 1944–1946, more than a million Poles from the Kresy moved to the Recovered Territories, including 150,000 from the area of Wilno, 226,300 from Polesie, 133,900 from Wołyń, 5,000 from Northern Bucovina, and 618,200 from Eastern Galicia. The so-called First Repatriation of Poles (1944–1946) was carried out in a chaotic, disorganized way. People had to spend weeks, even months at railroad stations, waiting for their transport. During that time, they were robbed of their belongings by the locals, Soviet soldiers or Soviet rail workers. For lack of railroad cars, in Lithuania at some point the "one-suitcase policy" was ordered, which meant that Poles had to leave behind all their belongings. They traveled in boxcars or open wagons, and the journey was long and dangerous, as they were not protected by the military or the police. In the immediate postwar period, Polish Communists, who ceded the Eastern Borderlands to the Soviet Union, were universally regarded as traitors, and Władysław Gomułka, First Secretary of the Polish Workers' Party, was fully aware of it. People who moved from the East to the Recovered Territories talked amongst each other about return to Lwów and other eastern locations, and a German return to Silesia, as a result of World War III, in which Western Allies would defeat the Soviets. One of the sayings of the postwar period was: "One atomic bomb, and we will again return to Lwów" ("Jedna bomba atomowa i wrócimy znów do Lwowa"). Polish settlers in former German areas were insecure about their future there until the 1970s (see Warschauer Kniefall). Eastern settlers did not feel at home in Lower Silesia, and as a result, they did not care about tools, households and farms abandoned by the Germans. Lubomierz in 1945 was in good condition, but in the following years, Polish settlers from the area of Czortków in Podolia allowed it to become a ruin. 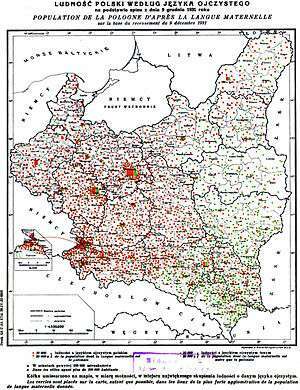 The Germans were aware of it: in 1959, German sources wrote that Lower Silesia had been ruined by the Poles. Zdzisław Mach, a sociologist from Jagiellonian University, explains that when Poles were forced to resettle in the West, which they resented, they had to leave the land they considered sacred and move to the areas inhabited by the enemy. In addition, Communist authorities did not initially invest in the Recovered Territories because, like the settlers, for a long time they were unsure about the future of these lands. As Mach says, people in Western Poland for years lived "on their suitcases", with all their belongings packed in case of return to the East. The population of Kresy was multi-ethnic, primarily comprising Poles, Jews, Ukrainians and Belarusians. According to official Polish statistics from interwar period, Poles formed the largest linguistic group in these regions, and were demographically the largest ethnic group in the cities. Other national minorities included Lithuanians and Karaites (in the north), Jews (scattered in cities and towns across the area), Czechs and Germans (in Wołyń and East Galicia), Armenians and Hungarians (in Lwów) and also Russians and Tartars. In 1931, according to the Polish National Census, the largest cities in Polish Eastern Borderlands were: Lwów (pop. 312,200), Wilno (pop. 195,100), Stanisławów (pop. 60,000), Brześć nad Bugiem (pop. 50,700), Grodno (pop. 49,700), Równe (pop. 41,900), Borysław (pop. 41,500), Łuck (pop. 35,600), and Tarnopol (pop. 33,900). A number of influential figures in Polish history were born in the area of kresy (note: the following list does not include Poles born in the cities of Lwow (Lviv), and Wilno (Vilnius) - see List of Leopolitans, List of Vilnius-related people). The family of current President of Poland, Bronisław Komorowski, hails from northern Lithuania. The mother of Bogdan Zdrojewski, Minister of Culture and National Heritage is from Borysław, and the father of former First Lady Jolanta Kwaśniewska was born in Wołyń, where his sister was murdered in 1943 by the Ukrainian nationalists. Franciszek Żwirko, aviator, born in Švenčionys, current Lithuania. Since some of the most distinguished names in Polish literature were born in Kresy (Adam Mickiewicz, Juliusz Słowacki or Czesław Miłosz), Eastern Borderlands have been mentioned and described in several works. Mickiewicz's Pan Tadeusz begins with the Polish language invocation, "O Lithuania, my fatherland, thou art like good health...." Other notable books that take place in Kresy, are Nad Niemnem, Sanatorium Under the Sign of the Hourglass, With Fire and Sword, Fire in the Steppe. In Communist Poland, all Kresy-related topics, such as Polish heritage in the East, or Massacres of Poles in Wołyń were banned for propaganda reasons, because these lands belonged to the Soviet Union. In official documents, people born in the Eastern Borderlands were presented as born in the Soviet Union, and very few Kresy-themed books or films were created at that time. One of the exceptions was immensely popular comedy trilogy by Sylwester Chęciński (Sami swoi from 1967, Nie ma mocnych from 1974, and Kochaj albo rzuć from 1977). The trilogy tells the story of two quarreling families, who after the end of the Second World War were resettled from current Western Ukraine to Lower Silesia, after Poland's borders were shifted westwards. After the collapse of the Communist system, the old Kresy returned to Polish popular culture in the form of historical polemics. Numerous books and albums were published about the Eastern Borderlands, frequently with original photos from the prewar era. Good examples of such publications are albums Kresy in Photos of Henryk Poddębski, published in May 2010 in Lublin, with forewords by well-known people with a Kresy background - Anna Seniuk, Krzesimir Dębski and Maciej Płażyński, The World of Kresy, with numerous photos, postcards and maps, Sentimental Journeys. Travel across Kresy with Andrzej Wajda and Daniel Olbrychski, and The Encyclopedia of Kresy, with 3600 articles, and foreword by another famous person from Kresy, Stanisław Lem. Articles about the Eastern Borderlands frequently appear in Polish newspapers and magazines. The local office of Gazeta Wyborcza in Wrocław in late 2010 began a Kresy Family Album, collecting stories and photos of those who moved from the East. In the first half of 2011, Rzeczpospolita daily published a series called "The Book of Eastern Borderlands" (Księga kresów wschodnich). The July 2012 issue of the Uważam Rze Historia magazine was dedicated to the Eastern Borderlands and their importance in Polish overall history and culture of the farewell past. 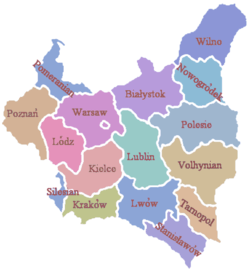 The territory known to Poles as Kresy is part of Ukraine, Belarus and Lithuania. Ethnic Poles still live in those areas: in Lithuania they are the largest ethnic minority in the country (see Poles in Lithuania), in Belarus they are the second largest ethnic minority in the country after the Russians (see Poles in Belarus), and in Ukraine, they officially number 144,130, but some Polish organizations claim that the number of Poles in Ukraine may be as many as 2 million, with most of them assimilated. (see Poles in Ukraine). Furthermore, there is a 50,000 Polish minority in Latvia. In Lithuania and Belarus, Poles are more numerous than in Ukraine. 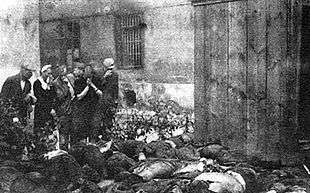 This is the result of the Massacres of Poles in Wołyń Voivodeship; those Poles who survived the slaughter begged for an opportunity to leave. Many Polish organizations are active in former Eastern Borderlands, such as Association of Poles in Ukraine, Association of Polish Culture of the Lviv Land, Federation of Polish Organizations in Ukraine, Union of Poles in Belarus, and Association of Poles in Lithuania. There are Polish sports clubs (Pogoń Lwów, FK Polonia Vilnius), newspapers (Gazeta Lwowska, Kurier Wileński), radio stations (in Lviv and Vilnius), many theatres, schools, choirs and folk ensembles. Poles living in Kresy are helped by government-sponsored organization Fundacja Pomoc Polakom na Wschodzie, and by other organizations, such as the Association of Help of Poles in the East Kresy (see also Karta Polaka). Money is frequently collected to help those Poles who live in Kresy, and there are several annual events, such as "Christmas Package for a Polish Veteran in Kresy", and "Summer with Poland", sponsored by Association "Polish Community", in which Polish children from Kresy are invited to visit Poland. Polish language handbooks and films, as well as medicines and clothes are collected and sent to Kresy. Books are most often sent to Polish schools which exist there — for example, in December 2010, University of Wroclaw organized event called " Become a Polish Santa Claus and Give a Book to a Polish Child in Kresy". Polish churches and cemeteries (such as Cemetery of the Defenders of Lwów) are renovated with money from Poland. For example, in Nysa, money is collected to renovate a Roman Catholic church in Lopatyn near Lviv, while residents of Oława collect funds to renovate a church in Sasiv, also in the area of Lviv. Also, physicians from Kraków's organization Doctors of Hope regularly visit Eastern Borderlands, and Polish Ministry of Education runs a special program, which sends Polish teachers to former Soviet Union. In 2007, more than 700 teachers worked in the East, most of them in Kresy. Studio East of Polish TV Wrocław organizes event called "Save your grandfather's tomb from oblivion" (Mogiłę pradziada ocal od zapomnienia), during which students from Lower Silesia visit Western Ukraine, to clean Polish cemeteries there. In July 2011, about 150 students cleaned 16 cemeteries in the areas of Lviv, Ternopil, Podolia and Pokuttya. Many treasures of Polish culture remain in the East. In Vilnius, there is the Wróblewski Library, with 160,000 volumes and 30,000 manuscripts, which now belong to the Lithuanian Academy of Sciences. In Lviv, there is the Ossolineum, one of the most important Polish culture centres. Adolf Juzwenko, current president of Wrocław's office of the Ossolineum, says that in 1945, there was a mass public campaign in Poland, aimed at transporting whole Ossolineum to Wrocław. It succeeded in recovering only 200,000 volumes, as the Soviets decided that the bulk of the library had to stay in Lviv. Even though Poland lost the Eastern Borderlands as a result of World War II, Poles affiliated with the Kresy still vividly remember those lands. Since Poles from current Western Ukraine mostly moved to Silesia, the city of Wrocław is regarded as miasto lwowskie (city of Lwów affinity), while Toruń, Gdańsk and Olsztyn are regarded as miasta wileńskie (cities of Wilno affinity). Ossolineum, famous library from Lwów, is now located in Wrocław, Polish academics from Lwów established Polish-language University of Wrocław (taking over from the old German University of Breslau) and Silesian University of Technology, at the same time, Polish academics from Vilnius opened Nicolaus Copernicus University in Toruń. There are numerous Kresy-oriented organizations, with the largest one, World Congress of Kresy Inhabitants (Światowy Kongres Kresowian), located in Bytom, and branches scattered across Poland, and in other countries. The Congress organizes annual World Convention and Pilgrimage of Kresy Inhabitants to Jasna Góra Monastery. Polskie Towarzystwo Miłośników Miasta Krzemieńca i Ziemi Krzemienieckiej (Polish Association of Lovers of Krzemieniec and Krzemieniec Land) from Poznań. Związek Sybirakow (Association of Sybiraks) from Warsaw, with branches scattered across Poland and abroad. Every year, in Masurian town of Mrągowo, there is Festiwal Kultury Kresowej (Festival of Kresy Culture), sponsored among others by the Senate of the Republic of Poland and the Minister of Culture of Poland, with patronage of the First Lady Anna Komorowska. The Festival is broadcast by TVP2 and TVP Polonia, and in 2011 it was organized for the 17th time. Among participants of the 2011 Festival, there were such artists, as Folk Ensemble Mozyrzanka from Mozyr, Children and Youth Band Tęcza from Minsk, Folk Band Kresowianka from Ivyanets, Polish Academic Choir Zgoda from Brest, Instrumental Band Biedronki from Minsk, Vocal Duo Wspólna wędrówka from Minsk, Children's Polonia Ensemble Dolinianka from Stara Huta (Ukraine), Ensemble Fujareczka from Sambir, Ensemble Boryslawiacy from Boryslav, Ensemble Niebo do Wynajecia from Stralhivci (Ukraine), Polish Dance and Song Ensemble Wilenka from Vilnius, Dance and Song Band Troczenie from Trakai, Band Wesołe Wilno from Vilnius, Song and Dance Ensemble Kotwica from Kaunas, and Folk and Polish Folklore Dance and Song Ensemble Syberyjski Krakowiak from Abakan in Siberia. Świdnicki Dzień Kultury Kresowej i Lwowa (Świdnica Day of Kresy and Lwow Culture) in Świdnica. In Lubaczów is a Museum of Kresy, and there is a project, supported by local government, to create a Museum of Eastern Borderlands in Wrocław, the city where a number of Poles from Kresy settled after World War II. Numerous photo albums and books, depicting cities, towns and landscapes of Kresy are published every year in Poland. In Chełm, there is Kresy Bicycle Marathon, Polish Radio Białystok every week broadcasts Kresy Magazine, dedicated to history and present times of the Eastern Borderlands. Every Sunday, Polish Radio Katowice broadcasts a program based on famous prewar Lwów's Merry Wave, every Tuesday, Polish Radio Rzeszów broadcasts a program Kresy Landscapes. In Wrocław, the Association of Remembrance of Victims of Ukrainian Nationalists publishes Na Rubieży (On the Border) magazine. Among best known Kresy activists of contemporary Poland are Father Tadeusz Isakowicz-Zaleski, and Dr. Tadeusz Kukiz, father of popular singer Paweł Kukiz. Since 2007, annual medals Heritage of Eastern Borderlands are awarded in Wrocław. The 2011 recipient was emeritus Archbishop of Wrocław, Henryk Gulbinowicz. Participants of annual Katyn Motorcycle Raid (Motocyklowy Rajd Katyński) always visit Polish centers in Kresy, giving presents to children, and meeting local Poles. The program of 2011 Days of Kresy Culture (October 22–23) in Brzeg covered such events, as: Kresy themed cabaret, promotion of Kresy books, Eastern Borderlands cuisine, mass in a local church, meetings with Kresy activists and scholars, and theatre shows of Brzeg's Garrison Club as well as Lwów Eaglets Middle School number 3 in Brzeg. Organizers of the festival assured that for the two days Brzeg would turn into the "capital of interwar Polish Kresy". In January, February and March 2012, Centre for Public Opinion Research made a survey, asking Poles about their ties to the Kresy. It turned out that almost 15% of the population of Poland (4,3 - 4,6 million people) declared that they either were born in the Kresy, or have a parent or a grandparent who comes from that region. The number of Kresowiacy is high in northern and western Poland – as many as 51% of inhabitants of Lubusz Voivodeship, and 47% of inhabitants of Lower Silesian Voivodeship stated that their family has ties to the Kresy. Furthermore, Kresowiacy now make 30% of the population of Opole Voivodeship, 25% of the population of West Pomeranian Voivodeship, and 18% of the population of Warmian-Masurian Voivodeship. The Polish presence in Kresy dates back hundreds of years. In the course of the time, two groups of Kresy dialects of the Polish language emerged: northern (dialekt północnokresowy), and southern (dialekt południowokresowy). Both dialects have been influenced by Ukrainian and Belarusian, as well as by Lithuanian, and to Polish speakers in Poland, Kresy dialects are easy to distinguish, as they sound more "musical". Before World War II, the Kresy area was part of Poland, and both dialects were in common use, spoken by millions of ethnic Poles. 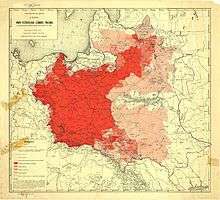 After the war, however, Kresy was annexed by the Soviet Union, and the majority of ethnic Poles were expelled westward, resulting in a severe decline in the number of speakers. The northern Kresy dialect is still used along the Lithanian-Belarusian border, where Poles still live in large numbers, but the southern Kresy dialect is endangered, as Poles in western Ukraine do not form a majority of the population in any district. Particularly notable among the Kresy dialects is the Lwów dialect formerly spoken in the city which emerged in 19th century and gained much popularity and recognition in the 1920s and 1930s, in part due to the countrywide popularity of numerous artists and comedians using it (see also: Dialects of the Polish language). ↑ Bernd Wegner (1997). From peace to war: Germany, Soviet Russia, and the world, 1939–1941. Berghahn Books. p. 74. ISBN 1-57181-882-0. ↑ "Jak odrodziła się wolna Polska.". Retrieved 2 July 2016. ↑ Zbigniew Gołąb, "The Origin and Etymology of Old Russian Kriviči," International Journal of Slavic Linguistics and Poetics 31/32 (1985, Festschrift H. Birnbaum): 167-174, page 173. ↑ "Gazeta Wrocławska - Wiadomości Wrocław, Informacje Wrocław". Retrieved 2 July 2016. ↑ "Obchody 65. rocznicy przybycia Sybiraków i Kresowiaków na Pomorze Zachodnie". Retrieved 2 July 2016. ↑ "Wyborcza.pl". Retrieved 2 July 2016. ↑ "Mieszkańcy Jasienia w Hołdzie Repatriantom z Kresów Wschodnich". Retrieved 2 July 2016. ↑ czesmen. "Trzcińsko-Zdrój nasza mała ojczyzna - Kresowiacy na Ziemi Chojeńskiej". Retrieved 2 July 2016. ↑ "Wykaz repatriantów przybyłych do Wschowy z kresów wschodnich II RP z maja 1945 r.". Retrieved 2 July 2016. ↑ "Gazeta Wyborcza, Kresowe życie na walizkach. Interview with Professor Zdzisław Mach, 2010-12-29". Retrieved 2 July 2016. ↑ "Bronisław Komorowski na Litwie: Jestem stąd :: społeczeństwo". Retrieved 2 July 2016. ↑ dook.pl. "Bogdan Zdrojewski - Rodzina" (in Polish). Zdrojewski.info. Retrieved 2014-05-15. ↑ "Ojciec Jolanty Kwaśniewskiej nie żyje - Wiadomości i informacje z kraju - wydarzenia, komentarze - Dziennik.pl". Wiadomosci.dziennik.pl. Retrieved 2014-05-15. ↑ "Dom Spotkań z Historią | "Świat Kresów" – drugie wydanie". Dsh.waw.pl. Retrieved 2014-05-15. ↑ "Przedszkole pięciolatka pakiet - Kopała Jolanta, Tokarska Elż". Selkar.pl. Retrieved 2014-05-15. ↑ "Książka Encyklopedia kresów - Ceny i opinie - Ceneo.pl". Retrieved 2 July 2016. ↑ Uważam Rze Historia (supplement), lipiec 2012. ↑ "2 miliony czy 146 tysięcy?". Retrieved 2 July 2016. ↑ Meksa, Michał. "Dzieci z Kresów zwiedzają Łódź [ZDJĘCIA]". Retrieved 2 July 2016. ↑ "Zostań polskim świętym Mikołajem - podaruj książkę polskiemu dziecku na Kresach.". Retrieved 2 July 2016. ↑ "TVP3 Wrocław - Telewizja Polska S.A.". Retrieved 2 July 2016. ↑ "Gazeta Wyborcza, Jak przesiedlić kulturę pozostawioną na Kresach, interview with Adolf Juzwenko, 2010-12-23". Retrieved 2 July 2016. ↑ "Światowy Kongres Kresowian". Retrieved 2 July 2016. ↑ "Festiwal Kultury Kresowej - Informacja Turystyczna w Mrągowie". Retrieved 2 July 2016. ↑ Wacław. "Olsztyn24 - Kaziuki w Olsztynie". Retrieved 2 July 2016. ↑ profile (1 March 2011). "Wileńskie Kaziuki w Poznaniu". Retrieved 2 July 2016. ↑ Sikorska, Fot. K. "Kaziuki w Suwałkach". Retrieved 2 July 2016. ↑ o.o., Avigail Holdings Sp. z. "Kaziuki w Warszawie". Retrieved 2 July 2016. ↑ MGE. "Wrocław: Medal dla kardynała Gubinowicza". Retrieved 2 July 2016. ↑ "Komandor Rajdu Katyńskiego: kresy to nasza historia". Retrieved 2 July 2016. ↑ "panorama.info.pl". Retrieved 2 July 2016. ↑ Karaś, Halina. "Gwary polskie - Kresowe odmiany polszczyzny". Retrieved 2 July 2016. ↑ USA, Translation Services. "Polish Translation. Polish Dialects". Retrieved 2 July 2016. Mały rocznik statystyczny 1939, Główny Urząd Statystyczny, Warszawa 1939 (Concise Statistical Yearbook 1939, Central Statistical Office, Warsaw 1939).